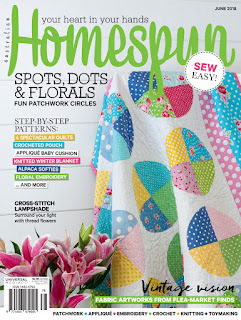 This month my Rose Garden Cross StitchLampshade pattern is published in Homespun Australia! After using the 3Chooks Lampshade Making Kit to bring my design to life, I wanted to find out more. Who is the woman behind this gorgeous craft kit who made my lampshade making dreams a reality from the other side of the globe? 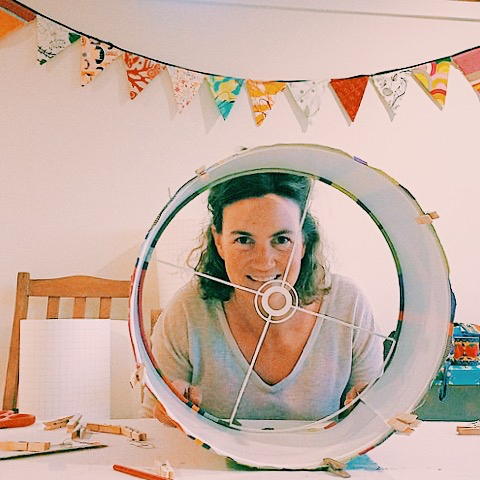 Anna Trigg crafts bespoke shades from her seaside studio, sells her lampshade making kits online and in Australian craft shops and, runs workshops guiding you through the process face-to-face while you hang out with like-minded Chookies. Anna also runs a craft group for her friends called Ditch n’ Stitch where they ditch their families, get together and drink wine and eat cheese and make stuff. It sounds like a little slice of heaven! 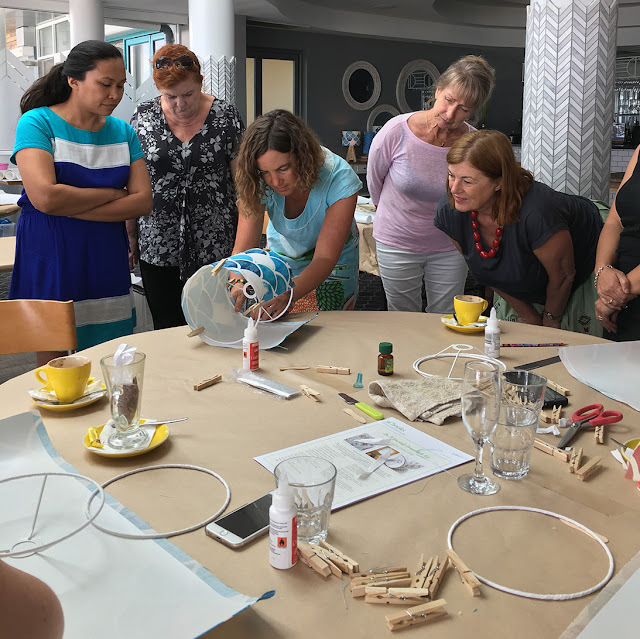 If like me, you're not in Australia, don't fret, her fantastic kits do a great job of teaching you how to make lampshade like a boss instead. Find out what's in the kit and how I got on with using it in my post, Review: 3ChooksLampshade Making Kit. I had the pleasure of chatting to Anna about how she balances running a creative business with family life, what it takes to launch a craft kit for the wholesale market and her favourite fabric designers! How did the 3Chooks come about? Me and my sister-in-law went to a local haberdashery just because we thought, there were no nice lampshades about, let’s make some. I had no intention to make a business out of it. I just see things and think, I can make that, and then I wanna learn how to do it. I’ve tried lots of crafts for that reason and that one, just by chance, turned into a business. There just wasn’t anyone lampshade making and it wasn’t that easy to find out how to make them at the time. Now it seems a much more popular pastime but 10yrs ago it wasn’t. So back then, when friends saw them they thought it was really cool and asked, can you make one for me?, and then friends of friends asked and it just became a business. The teaching. I’m quite a social person so I like the face-to-face element and it’s just so cool when people want to come and learn something they’re really interested in. They’re already engaged and excited about it before they even get there so it’s always a lovely, lovely experience and the people that book in are all like me! I love them. They’re interested in what I’m interested in so it’s always easy conversations. I try to keep it pretty relaxed but I also want to teach them the right way the first way so I’m a bit strict about making them do things again but I think they like that. They always go home with something that they love. Sometimes they think they’ll just make a practice one that they’ll never display but nearly everyone ends up taking it home and giving it pride of place as the lampshades look great from the first time you make them. How did you approach taking your kit to the wholesale craft market? I was finding making custom shades very time-consuming. I was making loads for display and people would be like, I like that one but I need it in a different size or colour, you know, just all that usual custom made stuff that happens. So I decided to make a kit thinking it’d help people who couldn’t make a fabric decision on the spot, they could have a go for themselves instead. At the beginning the kit was in very plain packaging, just brown paper bags with a sticker on them. Everything inside the kit was the same but it didn’t look like it does now. I had the plain kits for a few years but when I thought about doing the wholesale thing I thought, how’s it going to look on a shop shelf, in a retail space? And that made me want to make the packaging more exciting. One of my really good friends, Briar Forrester, is a talented graphic designer and she designed the packaging for me. I think because she knows me so well she really nailed the look straight away. It was really good fun working with a friend on the design and I just love how it turned out. What advice would you give for someone wanting to launch a product for wholesale? Really do the numbers and work out if you can afford to have a wholesale price. If you can't work out a good price it’s probably just not going to work in the long term. What helped me in the beginning is that I tested it on a shoestring budget. I made the kits up and printed off a few copies of the instructions from my home printer. I got about 20 different people test the kits and give me feedback. I changed things that didn't make sense to them and made sure it was at a workable stage before I invested any money in professional printing and supplies. Even after that, before I did the packaging that I’ve got now, I had it really simplified just to see whether people were willing to pay for it as a simplified version. Once I got it to a point where people were happy to pay, I then invested in the packaging to make sure it was really a shop-worthy product. It was little-by-little because I wasn’t willing to go full on at the start. I wasn’t that confident at the beginning that this would be where I’d end up so I built my confidence at the same time. I think it’s nice to have that slow, organic growth. You can just learn a little bit as you go along rather than really trying to learn everything in one hit. 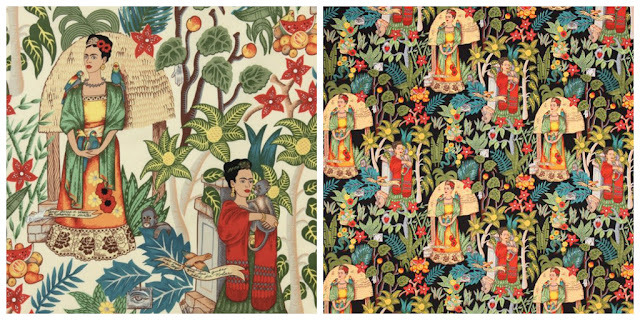 Who are your favourite fabric designers? I use a lot of Ink & Spindle fabrics. They’re just beautiful. They use Australian botanical illustrations and handprint them in Melbourne. I used to do some workshops in their studio and it was lovely going in there and seeing the printing presses and all the equipment, you can see it really is handmade in there. I love Cloth Fabrics by another Australian designer called Julie Patterson. She’s been designing for 20yrs, she’s English but moved over here when she was 18 and has been here ever since. She’s got beautiful stuff, similar to Ink and Spindle but more abstract. There’s some really beautiful contemporary indigenous fabric coming out of the Northern territories lately. I love the stuff that comes from the Tiwi islands, Tiwi Designs, Bima Wear, and Injalak Arts. I’ve really enjoyed using those indigenous printed works. Some of them have got little imperfections in the prints because they’ve been printed in the outback and you can see where hair’s stuck to the fabric or little bits of paint missing. 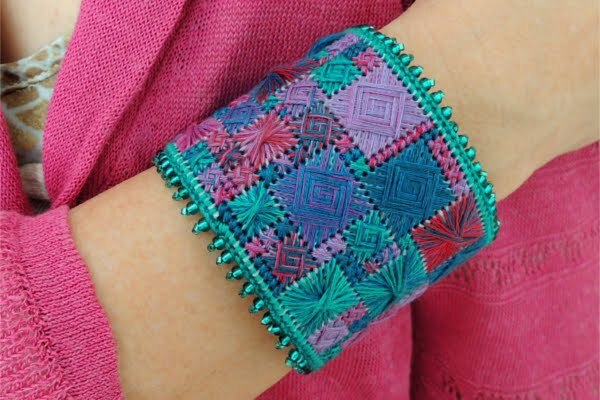 It’s beautifully done and nice to see those little imperfections and be reminded of where it came from. Everything’s Australian! 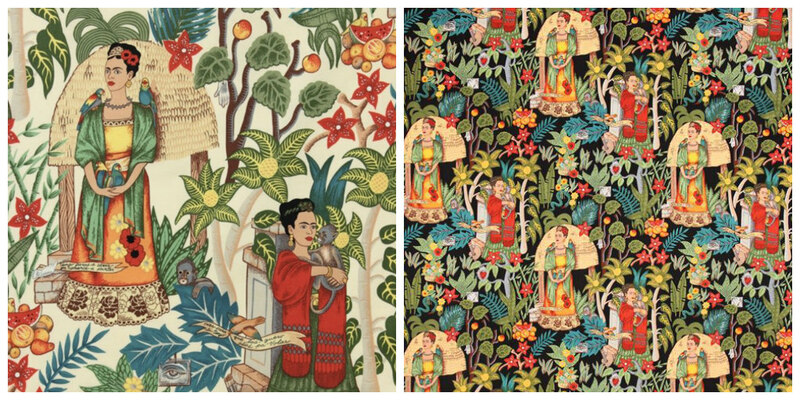 You celebrate your heritage in your products and fabric choices, is that on purpose? It was a conscious choice. I buy Australian if I can and I wanted to put my investment where my mouth is. If I’m putting out something in Australia I want it to be Australian as much as possible. Everything in the kit is Australian apart from the lampshade paper which is made in the UK but that’s because it’s the best lampshade paper available in the world. They don’t make a comparable product in Australia yet so I’m using that but everything else is. Some shades made during my workshop in the Ink & Spindle print room at the Handmaker's Factory in Melbourne. How do you balance running a creative business with having a family? At the beginning, when my eldest was 3yrs old I used to take her to the markets with me and she’d hang out on the stall and chat to the customers (and eat lots of snacks) and then when I had my second it was too hard to juggle so I decided to focus more on the website. Now I’ve got my youngest in pre-school 3 days a week so I only work those 3 days a week on the business. There are a few hours outside of that sometimes but generally I stick to those 3 days a week and I just do what I can. It’s really important to me to spend time with the kids outside of that. I’ve got a studio upstairs above the garage and as it’s a separate space I walk in and I’m at work and I walk out and leave the mess behind me and I’m finished. Even though I’m working from home, I’m not working in the house. I’m very lucky to have that as a lot of craft businesses set it up on their dining table and have to pack it away to have dinner…or just eat around it. What challenges have you’ve faced? I was pretty nervous when I decided to get the new packaging printed as it was quite a big investment compared to what I’d invested into it before. I started the business with about $700. It was such a low cost start up. When I invested in the packing I spent about 7 times that which felt like quite a step. I’ve got a lot of inventory now and when I introduce a new product I’ve gotta keep the inventory up so those challenges of balancing the books and still paying the bills are hard. Once I did some custom lampshades for a private client. They were made of silk and they turned out really badly, they didn’t work and at all and so I had to be honest with her and say I can’t do this, it didn’t work. What she wanted was more complicated than my ability allowed for at the time and she was really understanding even though we’d wasted a lot of time. That honesty helped it turn out okay in the end. I ended up finding her someone who could do it properly and she was happy with that. Asking for help's a good lesson to learn. How do you handle the stress of being your own boss? I don’t get that stressed by the business itself. I’m probably more stressed in my personal life and then I use the business as stress relief. I just try and do what I can do, sometimes you have expectations that you can get more done in the time you have and that can be stressful but I always try and think, it’s just a crafty lampshade business, I’m not rushing to the hospital to give someone a heart for a transplant so it can wait, it’s okay. 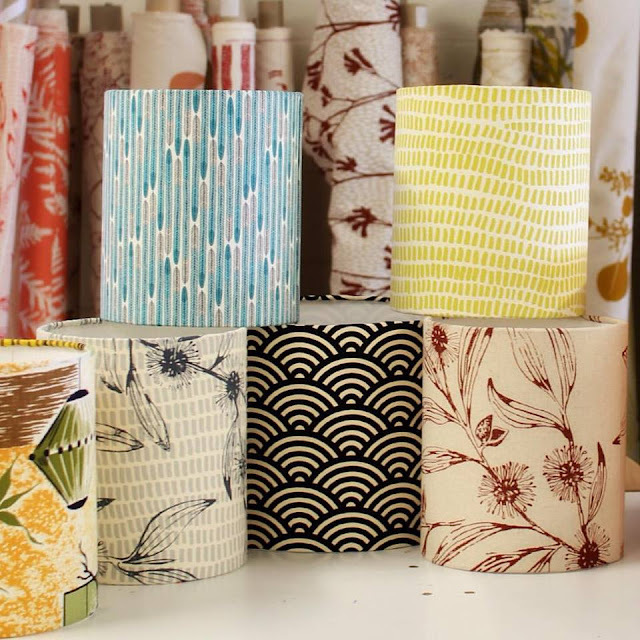 What's your advice for budding lampshade makers? Be patient, wait for the glue to go tacky before you stick your fingers all over it and just treat it like a meditation. It’s a lovely, relaxing craft so don’t get cross at it. For the beginner I’d recommend a natural fibre like cotton, linen or hemp. A medium weight fabric is great and fabrics like linen with a bit of texture add an extra dimension to the shade. Synthetic fabrics tend to fray and that can be really annoying when you’re learning. What's been your favourite shade to make so far? I made one for my friend Briar who did the design for the packaging and that was a Frida Carlo design by Alexander Henry. Frida’s garden, I love that one. It just looks spectacular in her house, it just goes with everything so well, I love going there and seeing it. Also, I made one for my mum because she bought me some fabric. That’s how I found out about Injalak Arts. She’d been traveling in the Northern Territories and bought some fabric from them. It’s really gorgeous, it’s a hand screen-print in graduating colours, it goes from dark green to lime green and into a powder blue, over a natural background. 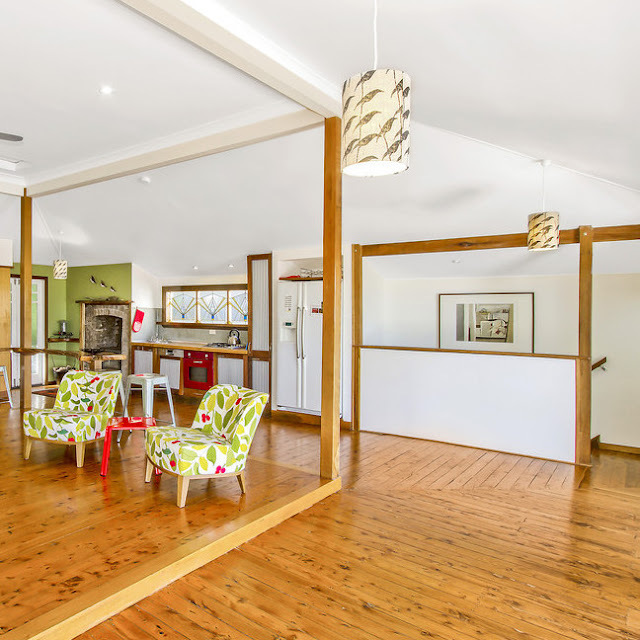 What's new at the 3Chooks? I’ve always only had a shade and no bases and my Chookies have often wanted to buy the whole thing in one go. It’s been a bit of a barrier for some people so I've created a really simple, cute wooden laser-cut slot-together base. Next, I want to show people all the different ways they could be customised. You could spray paint, dip-paint or draw on them. I could even have holes laser-cut so they could be stitched with matching thread …the possibilities are endless. I held back from trying to do anything with the bases because I didn’t really know what to do with the electric part but with this you just need a cord set. It just screws into the lampshade, not the base, which keeps it really simple. The cord set comes as part of the kit or you could put in an electric candle if you didn’t want the cord. A lot of the time I’m listening to the birds and enjoying the silence. On the days I’m making rather than doing computer work I listen to podcasts like The Slow Home Podcast or Pip Permaculture and just lately, an excellent Podcast called Ladies We Need To Talk and The Pineapple Project. I’m really enjoying Aussie artist Amy Shark too at the moment - check out the song Adore - such a great song! My husband is a musician and the bands we toured with get a play at home but generally not when I’m in my studio. Thank you so much, Anna! I really appreciate your chilled out approach to business and I'm taking your advice to heart. 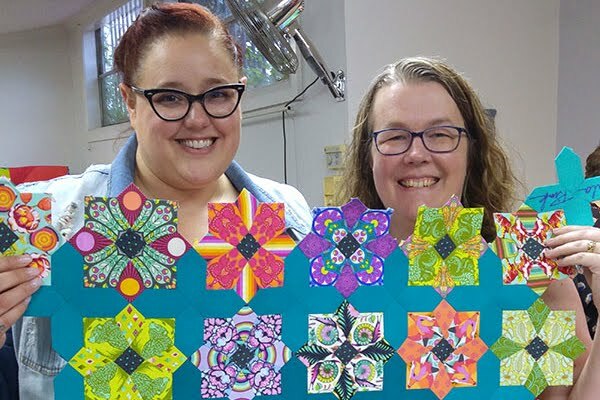 This is craft, not life and death, stress doesn't have to take root here. It's so easy to get caught up in the fear of the rat race and then feel overwhelmed, simultaneously stifling creativity and limiting productivity, but Anna's proof that taking it slow pays off. I also really enjoyed being introduced to Aboriginal textiles, printing methods and the designers and companies who are keeping these practices alive by giving indigenous textile artists a platform where they can thrive and share this beautiful aspect of Australian culture with the world. 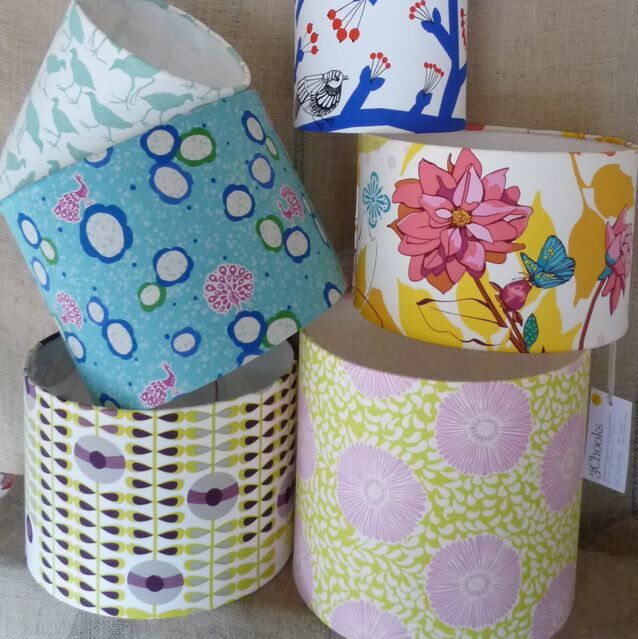 Feeling inspired to give lampshade making a go? Head on over to 3Chooks Lampshades to find out more and check out my review of the 3Chooks Lampshade Making Kit. I can't resist sharing a little taster the cross stitch lampshade I designed and show readers how to make (following Anna's expert advice) in June's issue of Homespun magazine, Vol 19.6. 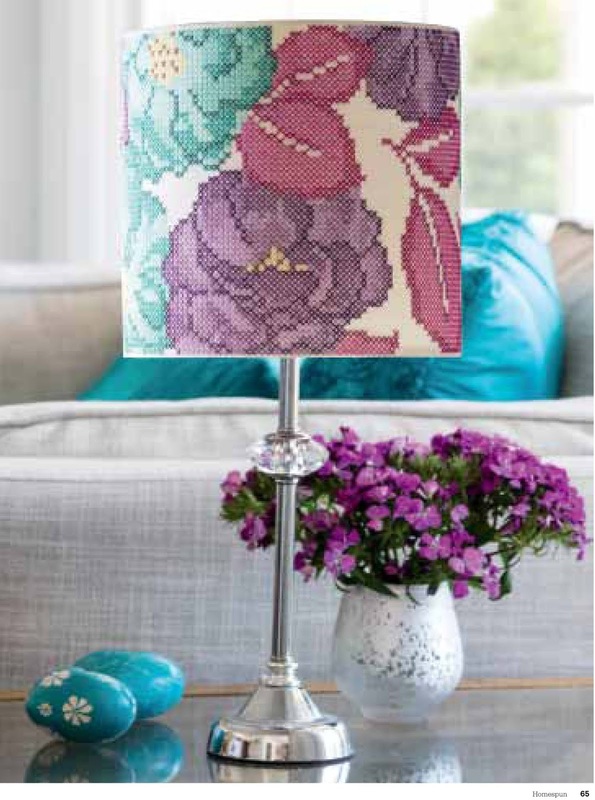 Find out more about my pattern over on my post, New Pattern: Rose Garden Cross Stitch Lampshade. 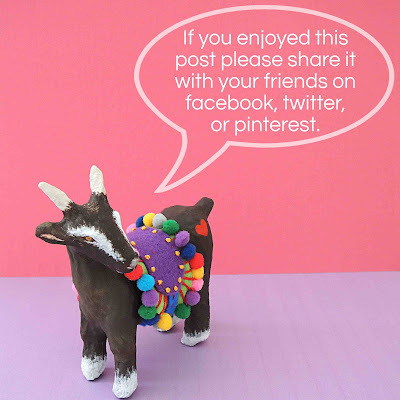 Would you like our sewing adventures, hot hand stitch trends and much more delivered to your inbox? Sign up to our newsletter! I can't promise it'll be weekly but I can promise you won't regret it. I'll be back soon with more stitchy adventures... Bobbin and Fred are keeping my hands busy and my imagination running riot. We're all buzzing about our up and coming adventures at Bobbin and Fred HQ. Until then, have a flossy good time! Wonderful interview! I really like the idea of being able to make a custom lampshade with a favourite fabric 😊 The new simple wooden bases are cute too and really go with the modern feel of the shades! This is a super interview and so informative. It was so interesting to read about Anna's journey, she has such a genuine easy spirit which comes through in her chat. 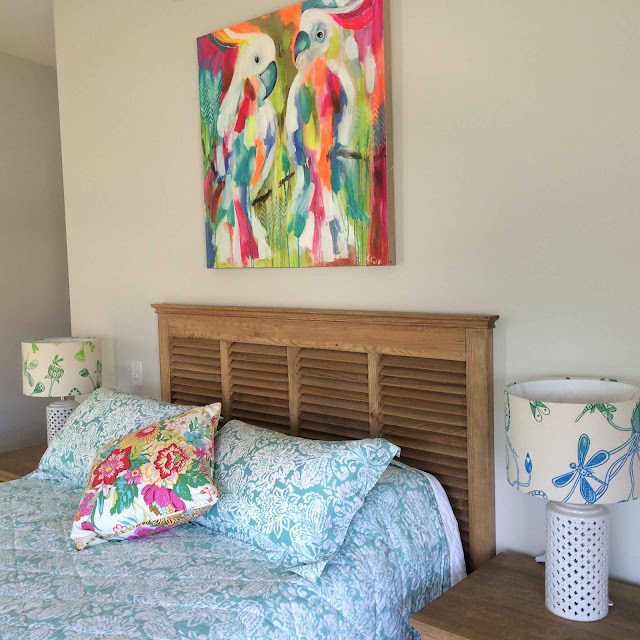 I love the Australian fabrics and also her new wood design base. I'm so pleased you enjoyed meeting Anna and learning more about her life and her products... I'm digging those Australian fabrics too and think the base is so clever!